« A Great Non-Christmas Movie To See! Yes, I do know that most church calendars called last Sunday the 4th Advent Sunday, but as I thought about this, I decided to count Christmas Sunday this year as the fourth. I hope you don’t mind, and it won’t make any difference to your children—I hope! Big Idea: Jesus was really born. This is not a fairy tale! His birth changed the whole world! It’s really hard to separate fact and fiction as a child. I just had a conversation with one mother who worried about whether pretending about Santa Claus might bleed over into her children thinking she was “pretending” about Jesus. I don’t really share her fear, but I do appreciate her sensitivity to the problem that many adults have of truly believing that Jesus was/is real! Go to the maternity ward of a local hospital during hours when newborns can be viewed. Try to pick out the one that looks like Baby Jesus. Of course, it would be a boy, not a girl. Would he be dark-skinned, pink, big, small, hair or hairless? It’s just a game, but Jesus did look just like one of these babies. If you can’t go to the hospital, then look at pictures of newborns on the computer. There was no room at the hotels. So where would you stay if you traveled to a new city and could not stay at a hotel? With a relative? But what if you knew no one? The only place you were offered was . . . . someone’s barn, or their garage . . . .or a basement . What if your house was the last hotel that Mary and Joseph came to and all the beds and couches were taken. Where would you put them? You might want to go out to the garage and look for a place to make a bed. No lights, just a candle. What do shepherds do at night while the sheep are sleeping? Some of them sleep while others watch the sheep! Turn out all of the lights in your kid’s room and let them watch the sheep. SUDDENLY a bright light appears! LOUD MUSIC starts with angels singing! Do you get the picture? Can you recreate that moment? No wonder the angels had to tell them not to be afraid! Where would you look for Baby Jesus if the angels told you to go to Bethlehem to find him? (Could draw a maze!) The hospital? The church building? 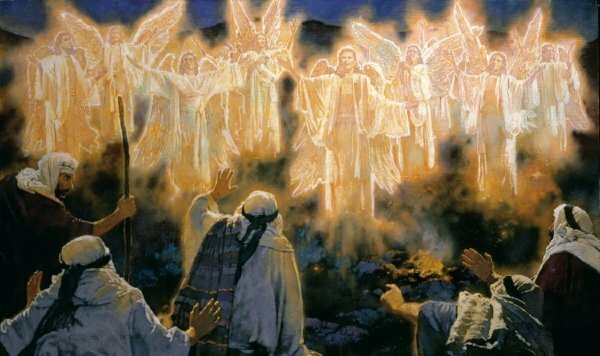 What clues did the angels give the shepherds? What if someone rang your doorbell in the middle of the night, looking for a new baby, what would you think? Where would they look at your house? Would they ever think to look in the garage?? After the shepherds left they couldn’t stop talking about what had happened to them and the baby they had seen! Why didn’t they keep it a secret—just for themselves?? Is this the same reason we keep talking about Jesus? What would be different in the world if Jesus had never been born? If you have watched It’s A Wonderful Life with your kids, then you can refer to what Bedford Falls would have been if George Bailey had never been born. But even without the movie, you can talk about this and see what the kids come up with. I do hope these small ideas have helped stimulate your own creativity in talking with your children about the birth of Jesus. I know you realize that your young kids are taking in everything you do and say, so the biggest activity of all in preparing your kids is to show them that Jesus means everything to you! The moments they hear you talking about Jesus, or doing for others in Jesus’ name, or remembering to thank God for Jesus when you pray instead of just asking for things . . . when they observe that you really love Jesus, even when they don’t fully understand what all of this means, they are being given the best gifts you have to give them, all you really want for them to learn from you! You are the star that guides them, you are the announcement of His birth, you are the messenger that God has chosen who blesses your children with the Good News that the Savior has come into the world and dwelt among us! and peace on earth to those with whom God is pleased.